The purple Yotel sign, many people have walked or driven by this on 10th Ave. photos by Max Hartshorne. Yotel's beds fold into couches. Here, the Yotel on 11th Avenue, New York City. 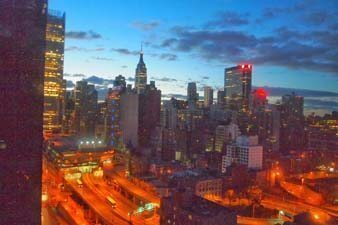 It’s hard to find a hotel that has everything a guest could possibly want for a reasonable price, let alone finding a hotel that fits that description in Manhattan. But the new Yotel in Times Square West has all of that, plus a robot. Already popular at a few airports like London Heathrow, the founders of Yotel had a vision of ingenuity and simplicity when they hatched the idea for Yotel. Founders Simon Woodroffe and Gerard Greene wanted the hotel to be located in one of New York’s fastest growing neighborhoods – Times Square West, in Midtown Manhattan. Yotel New York is the flagship U.S. location and opened in 2011. The large hotel building stands out prominently on Tenth Avenue with its trademark purple logo splashed across the front. The theme was inspired by first class air travel, and the language of luxury airline travel and Japanese influence has been translated into a small, but luxurious cabin. The compact cabins make the perfect size hotel room for an airport, where guests are waiting by the hour while on layovers and only need a small space to refuel and relax before their journeys continue. GoNOMAD was in the city for some business meetings in December 2013 and we decided to stay at the Yotel. We came away more than impressed! In fact we were so impressed that we stayed a second night and got a chance to sample the breakfast, the lounge, and the general ambience which is cool, fun and in some cases, packed with travelers. Breakfast at the Yotel was like being in Queens--every language imaginable was being spoken by hotel guests. It was a truly New York City moment! Monsoon rain shower at Yotel. “Yotel uses beautiful, functional futuristic design to create smartly designed ‘cabins’ that are fitted with all the extras you might find in a luxury hotel but at an affordable price. 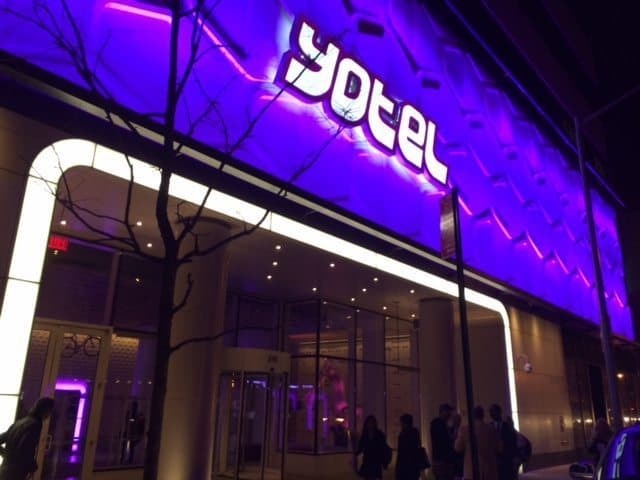 More comfort, more convenience and a more memorable experience for a value rate,” said a Yotel spokesman. Inside the Queen Cabin, for instance, the bed folds back electrically like a hospital bed, so it pushes out of the way while you’re not sleeping. We found the bed very comfortable, and there were plenty of fluffy pillows. The view out the window of the Empire State Building was a bonus! Modeled after the ‘airline style’ check-in kiosks, guests arriving at Yotel do not have to go through a tedious process to get to their cabin and can instead use kiosks, checking them into this fun and smart hotel. But should guests have any questions, the front lobby staff, or “Mission Control,” is standing by ready to assist. “These kiosks mean that no guest has to stand in line form filling, it takes literally under a minute to check-in, and it’s convenient, quick and easy. It also means that our Mission Control teams are freed up to help guests with anything else they need. 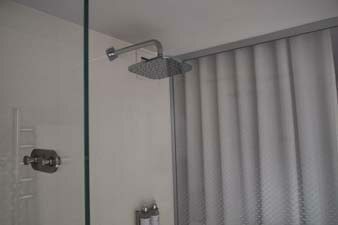 It’s also a way greener process than traditional hotels tend to offer,” she said. This is the biggest terrace in Manhattan, at Yotel, on 10th Ave NYC. The cabin bed, which also transforms into a couch for optimum use of space.cabin bed, which also transforms into a couch for optimum use of space. The hotel features 669 cabins that are equipped with all of the latest technology to make your stay as easy as it can be. Each Premium Cabin has 170 square feet of space and none of that space is wasted. The windows are floor-to-ceiling and feature spectacular city views, mood lighting, and near silent heating and cooling systems. NYC skyline from the 25th floor of Yotel, NYC. The bed transforms into a couch if guests want more room, and the showers offer a relaxing monsoon rain shower that makes the room seem even more tranquil. Each cabin also is equipped with a 32” flat screen TV, iPod and MP3 connection points, and a work space for those staying on business. The First Class Cabins and VIP 2 Cabin Suites include private outdoor terraces and Jacuzzis offering views of Manhattan that are sure to be cheaper here than anywhere else. 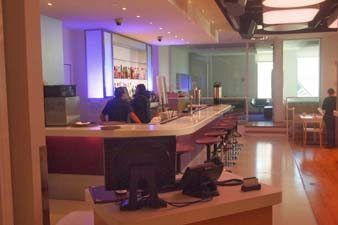 Yotel features 12,000 square feet of entertainment space which includes a restaurant, a club lounge, and outdoor terrace. All of the spaces in the hotel are designed for optimum flexibility. At 4000 square feet, the Terrace is the largest in Manhattan and stretches the entire length of FOUR, the epicenter of all of the hotel’s activities. During warmer weather, brunch, lunch and dinner are served as well as after work cocktails. The Club Lounge makes a great place for informal meetings and being social. At night, the lounge becomes a DJ Bar and dance floor with music and drinks.The restaurant is modeled after a Japanese Dojo, or sumo wrestling ring. The tables can be raised or lowered depending on the formality of the occasion and include comfy seat cushions. It can seat 110 people but has the intimate feeling of a small café with close friends. ctivities, from yoga to business meetings and private parties at night. the outdoor terrace, the largest in Manhattan.the outdoor terrace, the largest in Manhattan. Club lounge with a very long bar, gets hopping each night at Yotel. “The terrace is extremely popular, especially during the warmer months. 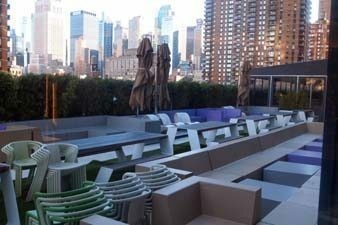 YOTEL offers one of the largest outdoor spaces in NYC, which guests really enjoy as outdoor space in the city can be challenging to find! 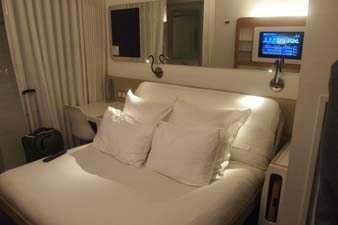 Guests also love YOTEL’s First Class Cabins and VIP Cabin Suites - several of these suites come with private outdoor terraces and Jacuzzi style hot tubs,” she added. Guests at Yotel also get free super strength Wi-Fi, including in their cabins, and complimentary hot drinks are available 24/7 on each floor of the hotel. You go to the little closet down the hall and you’ll find a free Keurig and vending machines with snacks. Even storing one’s luggage is an experience at Yotel, thanks to Yobot. Yobot is a giant robotic arm located in the hotel’s lobby that takes guests’ luggage and stores them in bar-coded bins. The entire process is done behind a glass display directly next to the hotel’s entrance, making a sightseeing experience available to guests without even leaving the hotel. "Guests love Yobot! All day long, you can find guests admiring YOTEL’s resident robot through the glass windows. The idea is literally a fun, playful solution to the challenge of ‘how to store luggage’ in an interesting way. It’s a very practical solution to allow guests luggage to be stored safely after checking out but still wanting to explore the city.”. Yotel attracts guests who appreciate great design, innovation, technology, and a great location. The X/Y generation. Guests get what they pay for and no much more, the hotel is an experience in and of itself without ever venturing out into the behemoth of the city. “We think that we have a great value product, hotels in this city are notoriously expensive, especially at high peak demand times, we are able to keep our prices great value because we are able to fit more ‘room’s into the space. 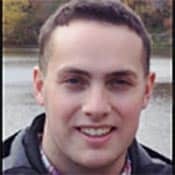 Daniel Peltier is a staff reporter for the travel news site Skift, in New York City. He began his travel writing after studying abroad, and then as an intern for GoNOMAD.com Travel. He got his journalism degree from the University of Massachusetts at Amherst.